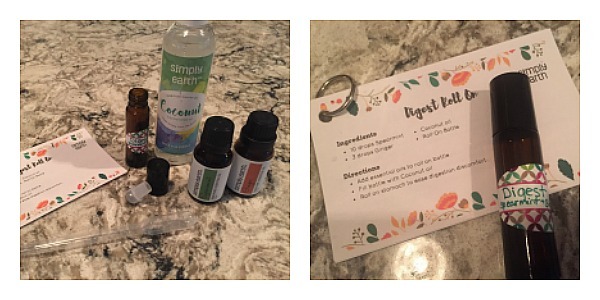 Pammy Blogs Beauty: Simply Earth Essential Oil Recipe Monthly Box: December Box Opening and DIY Projects! Simply Earth Essential Oil Recipe Monthly Box: December Box Opening and DIY Projects! So, as many of you know, I am totally into Essential Oils lately. While I am still somewhat new to Essential Oils, I am learning quickly! My downtime is spent pouring over Essential Oil books that I have checked out from the library and reading trusted blogs and websites with Essential Oil information. Not to mention, I am a bit obcessed with pinning Essential Oil recipes and DIY projects, lol! If you are not already, then be sure to follow my Essential Oils Pinterest board here. What prompted this new Essential Oils hobby? 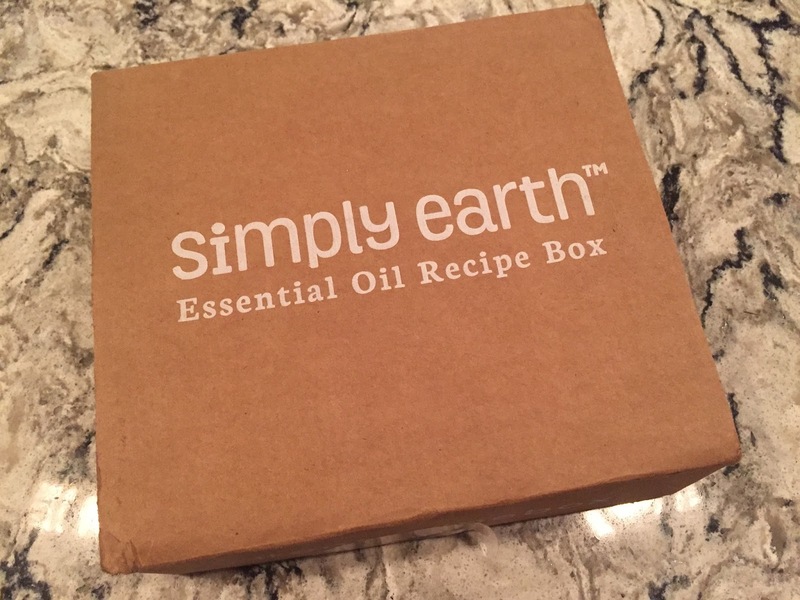 My monthly subscription to the Simply Earth Essential Oil Recipe Box! Simply Earth makes it so easy to explore, learn, and dive into essential oils. They offer a monthly subscription box that absolutely contains everything you need to get going on Essential Oil use and DIY projects. So excited about my Simply Earth monthly essential oils box subscription!!! It is literally like my favorite thing ever. You get 6-7 different recipes in each month's theme box plus 5 full size bottles of essential oils. Plus the labels, containers, ingredients, and supplies for all of the recipes included in the box. The recipes are pre-printed on cute index cards held together by a ring. Literally, Simply Earth takes all the guesswork out of DIY projects. They make it easy to get started with your DIY fun as soon as you open your box. So fun and a great value!!! Simply Earth makes exploring the world of Essential Oils easy and fun. Plus, can I just mention how amazing the oils are?!?! They are high-quality and theraputic grade. Such great quality oils. I am super impressed and already a loyal fan! 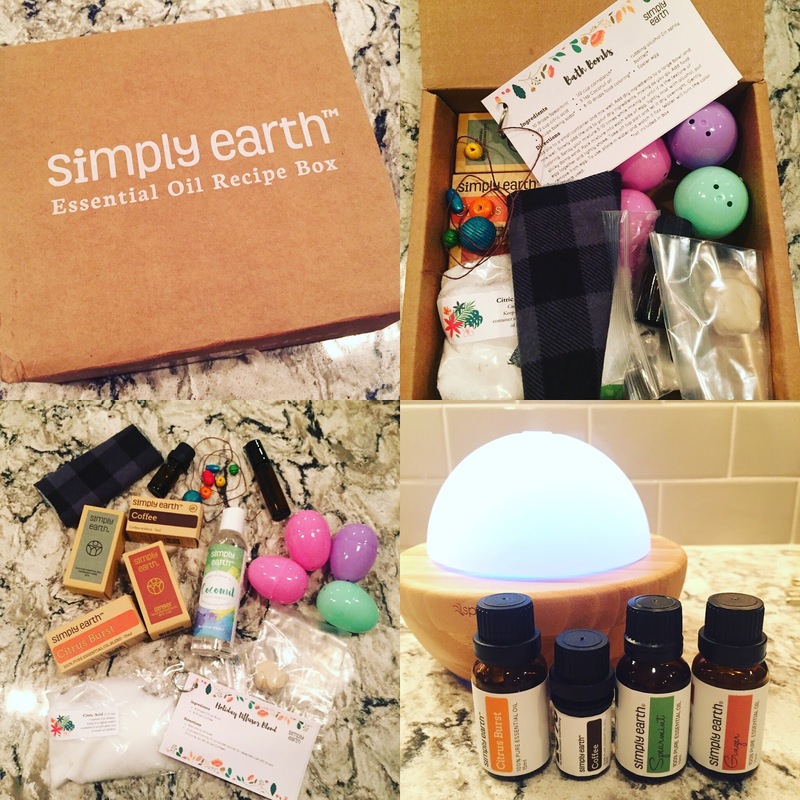 This month's Simply Earth box is awesome: Citrus Burst, Spearmint, Coffee, and Ginger EO's plus tons of great recipes and supplies to make a diffuser necklace, bath bombs, hand warmers, and more! I am really loving diffusing the Citrus Burst and Coffee recipe and I have totally fallen in love with the scent of the Spearmint EO! I am having a ton of fun with the recipes already. So, far I have made the Digest Roll On and it has already proven useful with all of this Holiday eating, lol! I can't wait to make everything else in the box. Index cards on a ring with 6 EO recipes: Digest Roll On, Holiday Body Scrub, Diffuser Necklace, Bath Bombs, Flannel Hand Warmers (this is going to be my next DIY project!!! ), and Holiday Diffuser Blend. Supplies for all the DIY recipes including: flannel fabric, glass roller ball, 5 ml glass bottle for blend, zipper pouch of citric acid for bath bombs, 4 oz bottle of Simply Earth Fractionated Coconut Oil, beads/string/clay for diffuser necklace, and 3 Easter eggs to use as molds for the bath bombs (so clever!!!). 4 Essential Oils: Citurs Burst (15ml), Spearmint (15 ml), Ginger (15ml), and Coffee (5ml). I absolutely adore this month's box and have become such a huge fan of Simply Earth! I feel like they make it so easy to use and explore essential oils. Plus, I no longer feel like I am pinning a ton of Essential Oil recipes and never making them, lol. With having all the supplies at hand, I can whip out an Essential Oil DIY in no time at all (because, after all, as a Mom of two preschoolers...who has much downtime!). Plus, it must be said that the quality and purity of the Simply Earth Essential Oils is just amazing! All of the oils are 100% pure Essential Oil. I trust this brand and know that I am getting great quality. I really enjoy exploring new oils that I might not have explored otherwise. Like, who would have known how much I would love the Citurs and Coffee blend! Not to mention, I have really been loving diffusing Citrus Burst on its own during the day for a refreshing and uplifting aroma! Subscribe to Simply Earth (with my code) and Get a FREE Diffuser!!! Enter code PAMMYFREEDIF to get a free diffuser when you subscribe (diffuser must be in cart for coupon to work): Subscribe here to sign up for box! Click here to add the diffuser to your cart when you order. Ooooh what a nice set!